Understanding evolving customer needs as well as the legislative compliance for differing sectors has positioned Booyco Electronics to offer application specific safety related solutions to customers across a range of industries. Graeme Jardine, general manager field services at Booyco Electronics, says that the company’s safety products portfolio has grown significantly since the company was first established 12 years ago. This market offering is underpinned by a solid field service support system ensuring customers of a rapid response across South Africa. Significantly, the company’s market offering, founded on leveraging best practice engineering and manufacturing, has produced a line-up of technologically proficient solutions. Jardine say that in addition to locally manufactured products, the company sources quality equipment where the economic justification for local manufacturing does not exist. Unpacking the core products, Jardine explains that the company pioneered proximity detection systems in the South Africa underground mining industry, and this offering was extended to surface operations. Interestingly, this is across several industry sectors now. Booyco Electronics’ fully integrated Proximity Detection System (PDS) represents the latest generation of this technology. The Booyco PDS, which provides a safety intervention capability with a data hub, has been well accepted in the mining sector with other industries rapidly incorporating the company’s technology into their safety programmes. Jardine says data is transferred between users via Booyco Electronics’ Human Machine Interface (BCI unit), with system communication with line managers, engineers using easy to understand icons. The company’s BEAMS software is used as a reporting tool to ensure that PDS events can be analysed and used as a change-in-behaviour tool. Many operations include the Booyco Biometric Control System as an integral part of their operating environment. This further enhances safe operating parameters as the system, which uses personalised ID cards, regulates access to restricted areas and validates licenced machine operators. “Importantly, BEAMS software can be configured for specific operational and application requirements allowing optimum flexibility underpinned by absolute reliability and accurate access to information,” Jardine says. Other Booyco safety products such as the Sentient handheld gas detection device and ESI Smart Sensor can be connected via the network to a downloading server, where specialised BEAMS software enables various reports to be generated. This includes detailed information on detection of gases, peak values, TWA values, pre-shift tested values, calibration reports and “no movement” reports. The IP68 rated Sentient handheld unit was developed to improve safety in underground mining or any confined spaces in surface operations. It is the first multi-gas instrument in South Africa to measure relative humidity as a standard offering. Gas monitoring at fixed locations is easily accomplished with the ESI Smart Sensor. This unit features a localised display of sensor information and significantly a single controller can measure 15 different gases. It can also accommodate other sensors with analogue outputs such as air velocity sensors or smoke detectors. “A natural addition to Booyco Electronics’ product line-up was the range of fire suppression technologies that were added earlier this year,” Jardine says. These products are a good fit and enable the company to provide the latest suppression systems as part of a total solution from a single service provider thereby creating a better value proposition. Booyco Electronics was appointed as the preferred distributor for Advanced Automation Systems (AAS); the company which exclusively markets the DAFO brand of vehicle fire protection and FirePro aerosol-based extinguishing systems in South Africa. “It is all very well to offer such fit-for-purpose technology, but our real differentiator is the level of technical assistance available both through our head office technical team as well as the competent individuals across our branch network,” Jardine says. The branches are strategically situated allowing proximity to customer operations in the major mining centres of the country. The current network includes seven facilities which is due to be expanded later in the year. 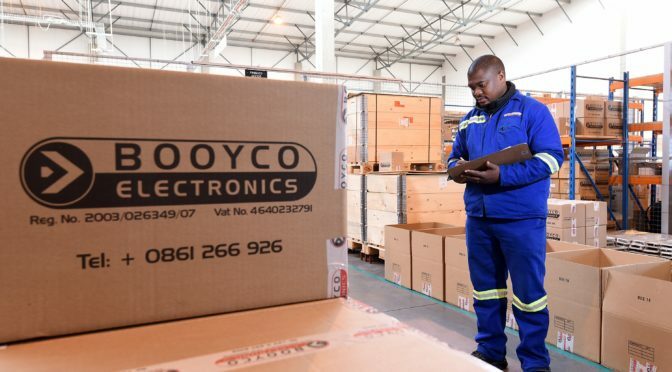 Field service teams ensure optimum uptime of all Booyco Electronics technology installations, branches maintain a parts stockholding commensurate with equipment populations in each region.